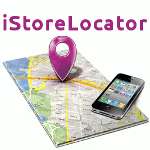 Search Module - Ideal Extensions for Joomla! 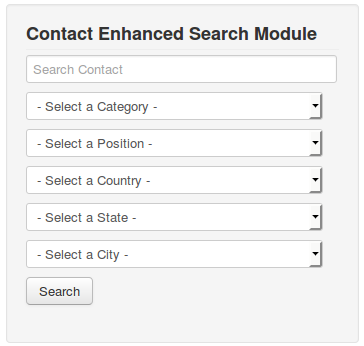 Contact Enhanced Search Module displays the a search box and optionally you can display a select box for Category, Contact Position, Country, State and City. When the Country is selected it will load therespective States for the country selected and once the State is selected it will load the cities in that state. Demonstration page See module on the right column. Select Extensions → Module Manager from the drop-down menu on the back-end of your Joomla! installation. Select add a new module and choose Contact Enhanced Search module! Under the Options tab you will see all available options for this module. Set Itemid: Assign an ItemID for the display of the search results. Most of the Search configuration is located in the Contact Enhanced Search Menu Item, so you need to link to a menu item here. If you do not want to display the Contact Enhanced Search menu item, you can add it to a menu type that is not visible. Button position: Choose where you want to display the button. Default is Bottom. If you want to display the filters fields below each other, then choose Bottom. Button Text: The text that appears in the search button. If left blank, it will load the 'searchbutton' string from your language file.